Hardcover: 288 pages Publisher: Bentley Publishers; 1 edition (June 2002) Language: English ISBN-10: 0837608597 ISBN-13: 978-0837608594 Product Dimensions: 9.3 x 8.3 x 0.8 inch In Corvette from the Inside Dave McLellan talks about his years at the center of Corvette Engineering, his take on Corvette history and many of the details that have made the Corvette a perennial favorite with millions of Americans. As McLellan describes the incredible highs and lows in the life of the Corvette, he also paints the bigger picture of the American auto industry's ability to rebuild itself whenever its survival is threatened. McLellan uses every tool at his disposal to tell his story, including original sketches and charts drawn by him exclusively for this book, scores of archival photos from GM, photos from his personal collection, and of course his own first-hand memories of 33 years at General Motors. Whether you're interested in the Corvette from an engineering perspective or simply a fan of the celebrated sports car, you'll want to own a copy of Dave McLellan's Corvette from the Inside. Cons: What's a bit disappointing about this book is a fair amount of mistakes that were missed by during the proof-reading process. At the end of this book, in his bibliography, author McLellan states, "The classic book on the Corvette is still: Corvette: America's Star-Spangled Sports Car." In paying homage to Karl Ludvigsen's seminal work, Dave McLellan shows he appreciates and respects fine writing, but anyone who reads McLellan's Corvette From the Inside will realize it is at least a classic in the same vein. I read this book twice–it's just that good. There are tons of Corvette techie books. 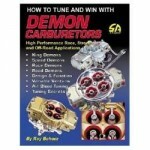 You can find titles on restoration, performance modification, car care, suspension upgrades and who knows what else, but you can't find books that offer a critical and historic view of the Chevrolet Corvette from a hard-core, engineering perspective...at least until recently, when retired Corvette Engineering Director, Dave McLellan, published this book. This is landmark literature for the Corvette hobby because, not only is it the first time Corvette's technical history has been researched and chronicled by someone with the credentials Dave McLellan carries--engineering degrees from Wayne State and MIT plus the SAE's prestigious Edward N. Cole Award for Engineering Innovation--but McLellan, as Corvette Engineering Director from 1975-1992, had first hand experience with a fair amount of what's covered in the book. In addition, not only is McLellan a polished writer, he's also a capable illustrator having created a fair amount of the art used in the book. Many will expect Corvette from the Inside to be McLellan's chance at an autobiography, but there is little of that. For the most part, the meat of this book is devoted to his engineering analysis of the Corvette, from 1953, right up into the C5 era and beyond, some interesting anecdotes of the car's engineering history and some very good explanations of certain aspects of automotive engineering. The history in this book is one of its most desirable qualities. McLellan covers wide and varied topics. In just the chapter titled "The Corvette Ages Through the 1970's" he discusses: gross vs net horsepower, the stillborn (fortunately) shared Corvette/Camaro platform, the decrease in performance due to Federal exhaust emissions requirements, the first Corvette hatchback concept car, how GM engineers solved the C3 brake caliper corrosion problem, the coming of Goodyear as the car's OE tire supplier and the early rollout of C4 mechanical features into the end of the C3 years. All of this is fascinating reading for anyone interested in the technical history the Corvette. There is much more of that kind of depth in the sections of the book covering the C4 and the early-C5 developments–many are unaware the McLellan and his team of engineers did most of the major design work on C5 and were responsible for virtually all of its basic architecture and a key element in its astonishingly good ride-and-handling: its stiff, backbone structure. What's a bit disappointing about this book is a fair amount of mistakes that were missed by during the proof-reading process. For example, Reeves Callaway's name is misspelled as "Calloway" in a few places and Doug Rippie's name is misspelled as "Rippy" consistently. The advent of computer engine controls in Corvettes came for the 1980 model year on cars sold in California, but it's variously listed in the book as either '80 or '81. The so-called "Zero Scrub" front suspension for C4 was introduced for '88 but, in the book, it's also listed as either '89, '90 or '98. In a chapter on engines, there is a discussion of combustion dynamics illustrated by a graph of combustion pressure vs. spark timing. The graph is clearly labeled as showing detonation, however, the illustration's caption states what is being graphed is "pre-ignition" but, then, goes on to describe detonation. Detonation and pre-ignition are two different things. There is no excuse for problems like this in a book published by a company with the reputation for quality automotive books which Bentley Publishers has. In reading this book it's hard not to perceive that the development and introduction of the ZR-1, in the 1986-90 period, hold some of McLellan's fondest memories of his service as Corvette Engineering Director. Some of his perspectives and observations are thought-provoking to say the least. Opening the chapter on the ZR-1 introduction he ponders, "In the summer of 1998, word first leaked out in the press that the ZR-1 Corvette was about to be introduced. For once, they were right, but how did they know?" I read that, and was struck by both the seeming naivety and the difference of perspectives that question revealed, then thought, well–duh! As early as 1986, engineers whom worked for McLellan were leaking details of the ZR-1 and its power-train to media. Back then, Doug Robinson was McLellan's Development Manager and I can remember, in the winter of '86/'87 while working for the now-defunct magazine "Corvette Illustrated", sitting in Robinson's office at Milford listening to him reveal details of what he called "King of the Hill." Then, a year and a half later, in June of 1988 at old Riverside International Raceway, Chevrolet Public Relations, during it's media preview for the 1989 models which McLellan attended, gave an official briefing on the LT5 engine, had three ZR-1 prototypes on static display and had race driver Kim Baker doing "drive-by" demos of a ZR-1 on the track. In reading McLellan's book nearly 15 years later, I was perplexed. Was he posing that question out of legitimate wonder or wry humor? The rest of that chapter and the one before it, which outlines the development story of the LT5 engine, just by themselves, are worth the price of the book to those interested in the ZR-1's contribution to the Corvette Mystique. 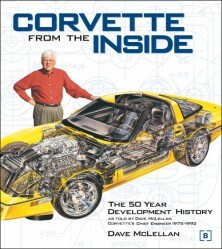 In total, McLellan's book, Corvette from the Inside, is a fascinating, very different kind of Corvette book. It's a very good look at America's Sports Car from an engineering perspective, a great narrative by one who was there and a worthwhile addition to any Corvette enthusiast's bookshelf. It could have been an absolutely outstanding work had Bentley Publishers worked a little harder during the editing and proofreading stages to fix some of its little problems.